Westmead Hospital new medical intern Dr John Lahoud. 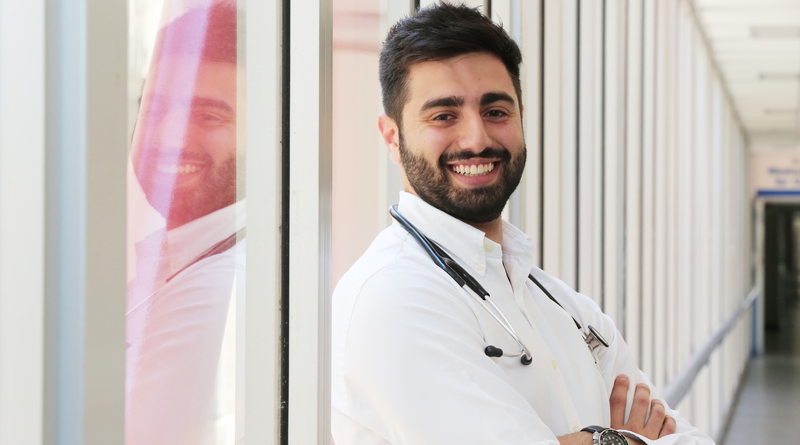 Rosehill resident and new medical intern John Lahoud was born at Westmead Hospital in 1993. Twenty-five years later, he is officially a doctor at the hospital. John is one of 92 junior medical officers who joined Westmead and Auburn hospitals this week as interns commencing two years of prevocational training. Another 55 have joined Blacktown and Mount Druitt hospitals. To support himself while studying, John worked at the hospital as an orderly for 17 months, where he transported patients to and from wards and provided assistance to nurses and allied health staff. Westmead Hospital’s teaching methods and innovative technology inspired the former Parramatta Marist High School student to apply for the internship at the hospital. Westmead’s new junior medical officers Dr Albert Vu, Dr Vickie Lee and Dr John Lahoud. “Working as an orderly was an important experience for me,” Dr Lahoud said. “It allowed me to truly appreciate the roles of teams and gave me an insight and the experience of working in a hospital environment. “This experience enhanced my studies, results and my ability to interact with people and patients. “It was during this time I made up my mind that I wanted to work at Westmead Hospital and be a part of the hospital’s future and redevelopment. Westmead Hospital’s chief medical advisor Associate Professor Roslyn Crampton said there are now more than 800 trainee doctors working across Western Sydney Local Health District (WSLHD). “Our new medical officers have accomplished a lot in their university studies,” Dr Crampton said. “Now they will all be building on their knowledge, skills and experience as they join the clinical teams who provide excellent care for our patients. “Westmead Hospital provides a rich training experience across all specialist areas including medicine, surgery and emergency medicine. The 2018/19 NSW State Budget has added 1,370 health staff, including 300 medical practitioners, 950 nurses and midwives and 120 allied health professionals – resulting in a record frontline clinical and clinical support staff of over 105,000 people. NSW, with 1021 intern positions, up from 999 last year, has more intern positions than any other state or territory – up 251 positions – or 32 per cent – since 2011. The NSW Government invests around $107 million on NSW’s internship program each year.